The death toll (over 200 hundred) and destruction caused by the 24 August, 2016 magnitude 6.0 earthquake that hit central Italy (Fig. 1), remind us once again how fragile is the Italian territory. Indeed, Italy is one of the most tectonically active regions in Europe. Although there is very little evidence for the occurrence of large magnitude earthquakes (i.e., > 7M), weak to moderate seismic shaking is relatively common and known to have caused much damage in the past and in recent times, especially in the Apennine Mountains. The Italian Istituto Nazionale di Geofisica e Vulcanologia (INGV) located the epicenter of the 24 August, 2016 earthquake near Accumoli, a small town in the Rieti Province (http://terremoti.ingv.it/it/ultimi-eventi/1001-evento-sismico-tra-le-province-di-rieti-e-ascoli-p-m-6-0-24-agosto.html). The earthquake had a very shallow focus, at about 4 km depth and devastated small towns situated within 10 km of the epicenter, in particular: Accumoli, Arquata del Tronto and Amatrice. The first INGV reports, available in Italian at http://terremoti.ingv.it/it/ultimi-eventi/1001-evento-sismico-tra-le-province-di-rieti-e-ascoli-p-m-6-0-24-agosto.html, show that the area affected by numerous aftershocks (on the order of hundreds, with the strongest one having magnitude 5.4), extends for about 25 km in NNW-SSE direction. This corresponds to the direction of the shallow fault that ruptured generating the earthquake (see http://autorcmt.bo.ingv.it/QRCMT-on-line/E1608240136C.html). The 24 August, 2016 earthquake was a normal fault event, which is consistent with the extensional tectonic regime which today dominates the Apennine Mts range. 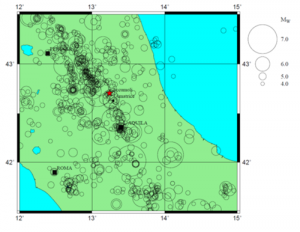 Most of the recent disastrous earthquakes, which occurred in central and southern Italy (e.g., the 1980 M 6.9 Irpinia, 1997 Mw 6.0 Umbria-Marche, 2009 Mw 6.3 L’Aquila) also had normal faulting mechanism. The high seismicity of the region affected by the 24 August, 2016 has been well documented through the historical records (three significant events occurred in 1627, 1639 and 1703, with magnitude ranging from 5.3 to 6.9). This portion of the Apennines falls within the highest seismic hazard class on the official hazard maps of Italy. This most recent disaster is thus another reminder that much more needs to be done in Italy in the field of prevention/mitigation of seismic hazards. Despite its moderate magnitude the 24 August, 2016 earthquake resulted in tremendous damage. This can be linked to the i) very shallow depth normal fault rupture; ii) poorly designed engineering structures such as buildings (the historic centers of the towns destroyed by earthquake had ancient centuries old constructions); iii) sites effects such as topographic/directional amplification), which can be expected in case of hilltop towns (e.g., Accumoli sited on an elongated ridge bordered by steep slopes). Considering the magnitude and rupture mechanism of the 24 August, 2016 event, one could expect triggering of numerous landslides (even on the order of hundreds). Indeed, landsliding represents an important collateral seismic hazard in the Apennines, where the widespread presence of weak geological materials results in a high susceptibility to failure even under non-seismic conditions. However, so far only very limited information is available on seismic slope failures during the event. The Italian media reported isolated cases of rockfalls and road embankment failures. Some roads in the epicentral area also resulted temporally non viable, because obstructed by rock masses. The post-earthquake slope failure hazard may persist for some time as the seismic sequence is likely to continue for days or weeks. One aftershock occurred within hours after the mainshock exceeded magnitude 5, and there were several others with magnitude > 4.